Mormon Church money: Why the LDS Church needs to save for the future. How money has shaped Mormon culture. Photograph by George Frey/Getty Images. Read all of Slate’s coverage of Mormonism. Temple Square, the headquarters of the Church of Jesus Christ of Latter-day Saints, covers 10 acres on the northern edge of Salt Lake City. To the north stands a large Mormon conference center, and to the south a shopping mall that the LDS Church owns. In the center loom the 19th-century Gothic towers of the Mormon temple itself, oddly juxtaposed with the 1970s-era concrete anonymity of the Church Office Building across the square. Between the two are scattered other meeting halls and administration buildings, and constant crowds of people. Men in white shirts and ties and women in heels and hose hustle from doorway to doorway. At spots with more striking views of the temple there are always two or three young women in wedding gowns taking photos with their beaus. Two groups in this tableau are particularly worth noticing. Female missionaries in skirts and sensible shoes stand near the gates of the square ready to greet visitors and offer tours. They wear small flags pinned above their name tags to signal their countries of origin. Depending on the time of year a visitor might also notice platoons of landscapers. The square hosts two reflecting pools, strategically positioned to catch images of the temple, as well as 250 immaculately tended flower beds. Every spring and fall, a small army of workers in T-shirts and dungarees sweep through the square, uprooting and replanting some 750 varieties of plants, leaving gardens redesigned for the season in their wake. In the fall, they hang several hundred thousand Christmas lights, and in January they take them down again. The visual contrasts of Temple Square—the Church Office Building and the temple, the conference center and shopping mall, the missionaries and the groundskeepers—not only tell us a lot about Mormonism’s present, but also point toward a very possible future. Far from the ragged frontier faith it was in the 19th century, Mormonism long ago embraced the respectable, button-down values of the American middle class, and that sensibility has shaped the decorous sense of spirituality that fostered the carefully manicured lawns of Temple Square. That same middle class has largely funded those efforts. But the church is growing most rapidly not in middle America, but in the homelands of those missionaries with the often unfamiliar-looking flag pins. Of the roughly 14 to 15 million Mormons in the world, fewer than half of those now live in the United States. Most of the rest live in Latin America, Asia, and Africa. Around the world, the Church has been building meetinghouses that often resemble those back in the United States, using funds drawn largely from North American bank accounts. What will happen when the middle-class Americans who have long constituted the Mormon base dwindle to a fraction of the world’s Mormons? And what changes might that bring to Mormon culture? To answer those questions, it helps to look at the religion’s past. The fiscal well-being—and the fiscal policies—of the LDS church have fluctuated enormously in the religion’s roughly two-century history. For the first 100 years, Mormonism foundered financially. Joseph Smith, the faith’s founding prophet, was focused on building Zion and cared little about balanced books. Under his leadership and that of his immediate successors, the private property of the church and of the church’s leaders sometimes became hopelessly intertwined. This casual approach to finance was mirrored in the informality of Mormon worship, which, back then, was often marked by impromptu preaching, prophesying, and even speaking in tongues. In the 1880s, however, the federal government seized much of the church’s property—temples, meetinghouses, and businesses—as part of its effort to stamp out polygamy. Though some of this property was restored, the era of prosecutions left the faith near bankrupt. The church leadership found a partial solution at the turn of the 20th century, when they began stressing that devout Mormons should contribute 10 percent of their income to the church. The practice of tithing revolutionized Mormon life. Some estimates peg the church’s annual tithing revenues today at around $7 billion a year. And as the church’s economics changed, so did its culture. The church began spending money on, for instance, Temple Square. In 1904, an information booth for tourists opened, followed by visitors’ centers on either end of the square—large, museum-like affairs with displays on Mormon history. In 1935, the flower beds were installed, and the 1960s brought seasonal landscaping with Christmas lights and perennials. And this evolution of Temple Square is a microcosm of broader trends within Mormonism. Soon after World War II, the LDS Church began to invest heavily in Brigham Young University. The plan was both to make the university a nationally recognized institution—and to create greater social mobility for young Mormons. It was, in a sense, a Mormon version of the GI Bill. Even today, BYU stresses that it is an undergraduate, rather than a research, institution, and devotes outsized resources to professional training in law, business, and computer science. Tuition for a full-time LDS student at BYU today is $2,280 per semester, making BYU a respected private school that charges like a cheap public school. And as with Temple Square, a chunk of that tuition money goes to maintaining the military precision of the school’s manicured lawns, many of which have small signs commanding pedestrians to stay off. That fixation on respectability and nice things gradually came to shape Mormonism’s spiritual ethos. In the 1950s, as the church began to attract converts around the world, Mormon leaders began to advise missionaries to don white shirts and ties, and the clothing became standard in Mormon worship services as well. The church’s recommended clothing for female missionaries reflects a similarly upscale American sensibility. At the same time, church leaders began to emphasize the spiritual virtues of “reverence,” which meant, essentially, the ability to sit still during long meetings. Mormon spirituality began to turn toward the formal, the sedate, and the contemplative. Older traditions—like speaking in tongues, playing music during the Lord’s Supper, and charismatic preaching—faded, and the Mormons became full-fledged members of the sober American middle class. Associating the spiritual with dignified bourgeois tastes also influenced the ways the church chose to spend its money. In that same decade, the 1950s, the church established uniform architectural and interior design guidelines for meetinghouses. Today, nearly all Mormon meetinghouses feature prints of the same traditional religious artwork, the same comfortable but not sumptuous furniture, and the same neutral carpet tones. The décor would not look out of place in an insurance office, but for the many pictures of Jesus. Stained glass or Gothic towers and other baroque decorations that occasionally graced earlier Mormon chapels—which now signaled garishness to Mormon leaders—were abandoned. Throughout the second half of the 20th century, standardized Mormon chapels spread across the world, followed by Mormon temples. There are now tens of thousands of the former and 138 of the latter. The church makes no apologies for spending heavily on the temples, which are meant to be remarkable outside and beautiful inside. They are typically large, constructed out of white stone and often landscaped in imitation of Temple Square. Most have floodlights keeping them illuminated at night. While meetinghouses are furnished like corporate offices, temple furnishings more closely resemble the lobbies of premium hotels. To Mormons, the interior of a temple holds the same hushed feel as a serious museum. The atmosphere is one of spiritual tranquility, grandeur, and formality. Managing this real estate, keeping the floodlights on outside the temples and the plumbing and heat at work in the meetinghouses, subsidizing education at BYU—all of these things are an enormous financial drain for the church. This is where most tithing revenue goes. And for many Mormons, it’s worth it: The tidy beauty of Temple Square and other places like it embody the comfort and order that their faith brings to them. As Catholics encounter divine presence in cathedrals and Muslims in mosques, the gardens and especially the temples of their faith are where Mormons go to find God. The visionary otherworldliness of early Mormonism has been submerged into a thoroughly respectable, if sometimes bland, material spirituality. As the church has grown it has also invested in various businesses: media, real estate, insurance, and publishing. The church’s leaders emphasize financial prudence, staying out of debt, and banking financial reserves in cash, in real estate, in stocks, and other forms. But this financial success has also earned the church suspicion: Mormonism appears shadowy, powerful, and secretive. It demands that its members give it money. Americans have historically been leery of any sort of hierarchical religion, and Mormon wealth has exacerbated traditional fears of the faith. Some writers, like Ryan Cragun or Chris Lehmann, believe that Mormonism’s wealth is de facto suspicious, and compare it to other large financial institutions that have lately let down the American economy. But there’s an irony here, because the rise of the Mormon financial empire may simply reflect a prudent determination to sustain the respectable, middle-class identity that has become so central to the church in the past century. Deepening the irony is that such careful planning seems in certain respects doomed to fail. Despite the steady spread of meetinghouses and temples across the globe, increasing numbers of Mormons, those from Africa or Latin America, do not fit the middle-class mold. To be sure, not all of these members are active Mormons. 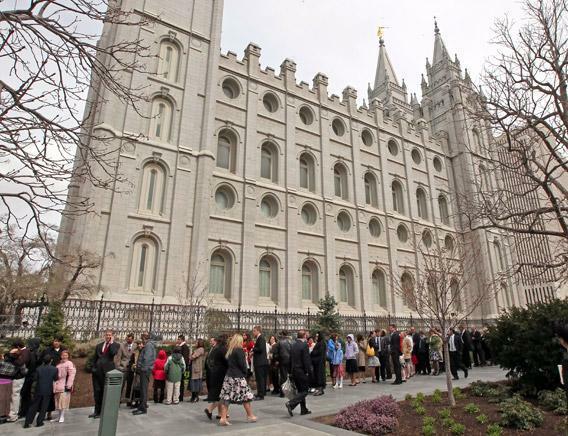 According to one study, only about 40 percent of the Mormons on the rolls of the church in the United States attend church, and in other countries the numbers are even weaker. In 2000, for instance, only about 200,000 Mexicans identified themselves as Mormons on a national census, even though the church counted more than 850,000 members there. Regardless, the gap between the number of American Mormons and the number of international Mormons is growing larger. For years now, places like Mexico have fueled the church’s growth. In the United States, the church grew between 1.4 and 1.95 percent per year over the last decade—mostly, it seems, through procreation. Outside the United States, growth rates are much higher. Mexico and Brazil both added 350,000 Mormons between 2000 and 2010; Chile and Peru nearly 150,000 each. There are similar numbers in other nations. Americans, though, almost certainly continue to provide a significant majority of the church’s tithing. Per capita income is far higher in the United States than in Chile or Mexico, of course, and American Mormons like Mitt Romney, Jon Huntsman, Sr., and J. Willard Marriott help constitute a group of major “donors” not much present in other countries. These men—and millions of other largely middle-class American Mormons—are accustomed to their tithing funding the well-to-do church culture they were raised in, and which facilitates their own spiritual lives. It seems natural to them that this form of Mormonism should be spread—and even, perhaps, enforced. In the early 1960s, some enthusiastic Africans discovered Mormon magazines and missionary tracts and began practicing their own version of the faith absent any official representatives of the church, a curious turn of events—with echoes of The Book of Mormon musical—which inspired LDS leaders to create standardized practices and lines of authority. Thus, when a Mormon leader visited Africa in the 1980s, he found he had to correct what one Mormon magazine described as “omissions and errors,” among them “hallelujahs, drum beats, and the passing of collection plates” more reminiscent of traditional African worship than modern Mormonism. Church media consistently depicts members in Latin America or Africa dressed in white shirts, ties, and skirts, and worshiping in meetinghouses identical to those in Utah. American Mormons frequently praise these members for pursuing the virtues that made Mormons successful in the United States: education, entrepreneurship, hard work, and practical ambitions. But even the most devout Mormons in Africa and Latin America can only provide a fraction of the church’s annual tithing revenues. Which is why, as the Mormon population outside the United States rises—and as demands for temples, meetinghouses, and other church resources in the global south rises—the church may find it has backed itself into a corner. It has closely bound Mormon faith to the tastes and mores of the American middle class. As its growth outside the United States continues, the costs of such things will be considerable. Hence, it appears, the church’s investments in real estate and shopping malls. Eventually, as has happened already to Roman Catholicism, Pentecostalism, and Methodism, Mormonism will become a religion of the global south. And when that shift takes place, the money to keep the Christmas lights on in Temple Square will have to come from somewhere.